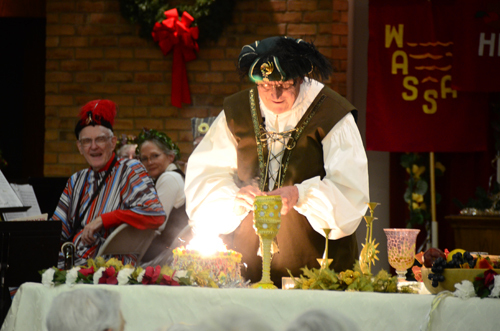 LEBANON - Plans are underway for the 19th annual Renaissance Feaste at 6 p.m. on Jan. 10-11 at Otterbein Lebanon Senior Lifestyle Community. These evenings feature a complete Boar’s Head dinner and entertainment hosted by court officials to celebrate the season of Epiphany. Doors open at 5:30 p.m.
Otterbein’s multi-purpose room becomes a great castle hall where guests are entertained by members of the royal court, pages, dancers and court musicians. All of the performers appear in 16th century costumes. Many of the performers, as well as the majority of the servers, are residents. Musicians include the 16-voice Renaissance Chorale under the director of Monica Rhude, the Otterbein Recorder Choir directed by Bill Farlee, area harpist Jane Zopff and a trumpet trio. The Renaissance Feaste meal of roast pork, red potatoes, winter vegetables and salad culminates with the serving of flaming pudding, amidst copious toasts from the wassail bowl. All seats are reserved. Tickets are $15 and include the complete dinner and entertainment. Reserve your seat by calling 513-696-8575 after Dec. 10. Proceeds from the event are used to support Otterbein’s Benevolent Fund and other special projects. All ticket sales are final. Barbara Patterson chairs the Renaissance Planning Committee, which is comprised of Otterbein residents. Many residents are involved in serving the Renaissance meal, portraying members of the royal court, providing music, sewing costumes, directing the drama and taking care of numerous details. To learn more about Otterbein Senior Lifestyle Choices, please visit www.otterbein.org.